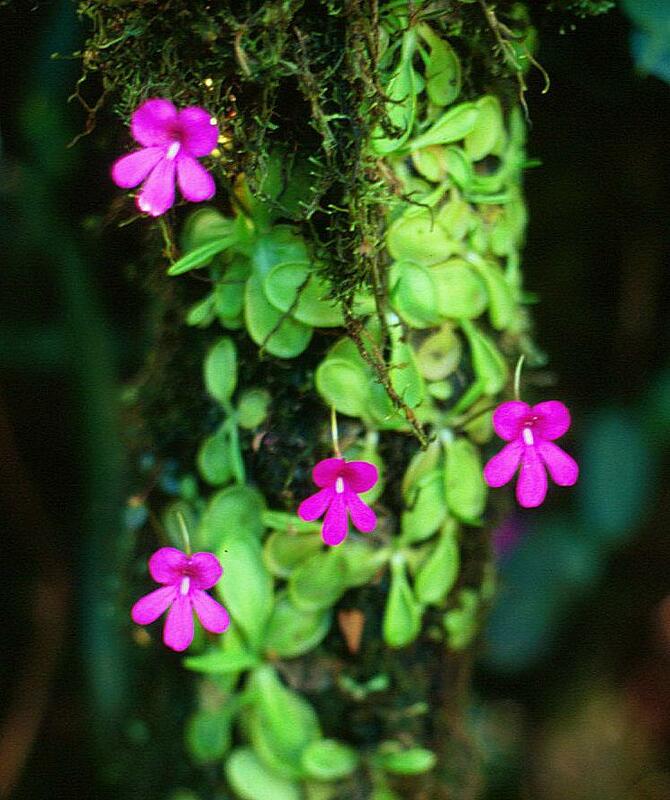 "Una especie nueva de Pinguicula (Lentibulariaceae) de centroamerica". 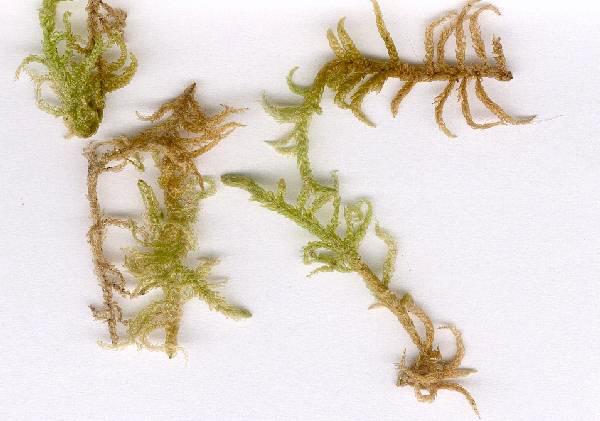 Herba perennis, epiphytica vel epipetrica. Folia radicalia rosulata, in duabus seriebus deposita; folia "hiemalia" 14 - 16, spathulata, modice dense vestita, 5 - 9 15) mm longa, 2 - 3 (4.5) mm lata; folia "aestivalia" 4 -8 (12), petiolata, laminae obovatae, oblongaeusque ad suborbiculatae, basi vix truncatae, margine leviter involutae, superne glandulis sessilibus et glandulis stipitatis dense vestitae, 12 - 27 mm longae, 10 - 25 mm latae; petioli villosi ciliati, 6 - 8 mm longi. Hibernacula ignota. Pedunculi 1 - 4 (8) erecti, teretes, glandulosi, basi glabrescentes, 40 - 80 (100) mm alti, uniflori. Flores 25 - 40 mm longi (calcare incluso). 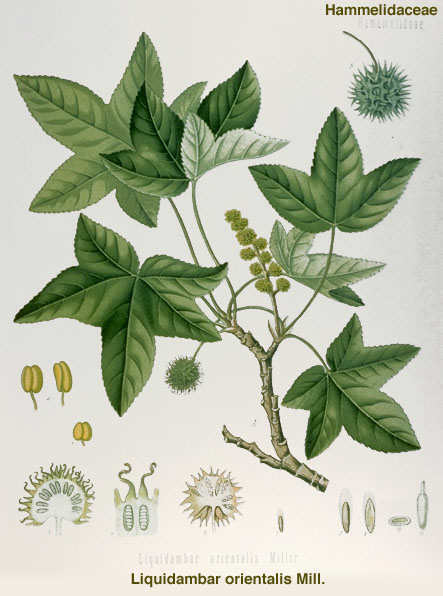 Calyx bilabiatus, extus glandulis stipitatis modice dense obsitus; labium superum profunde tripartitum, lobis oblongis, labium inferum usque ad 2/3 longitudinis bilobum, lobis oblongo-lanceolatis. Corolla profunde bilabita, rubro-purpurea, labium superum bilobatum, lobis suborbiculatis vel oblatis, rotundatis, 4 - 8 mm latis. Tubus brevissimus infundibuliformis, 3 - 4 mm longus, sine palato, intus pilosus, pilis cylindrico-subulatis. Calcar subulatum, acuminatum, recurvatum, 14 - 20 mm longum, tubum limbumque corollae subduplo superans. Stamina 2 mm longa. Ovarium subglobosum, glandulis stipitatis disperse obsitum. Capsula ovalis, 3 - 4 mm longa, 2.5 - 3 mm lata, parum glandulis stipitatis obsita. Semina innumerabilia, fusiformia, +/- 1 mm longa, +/- 0.25 mm lata, reticulata. 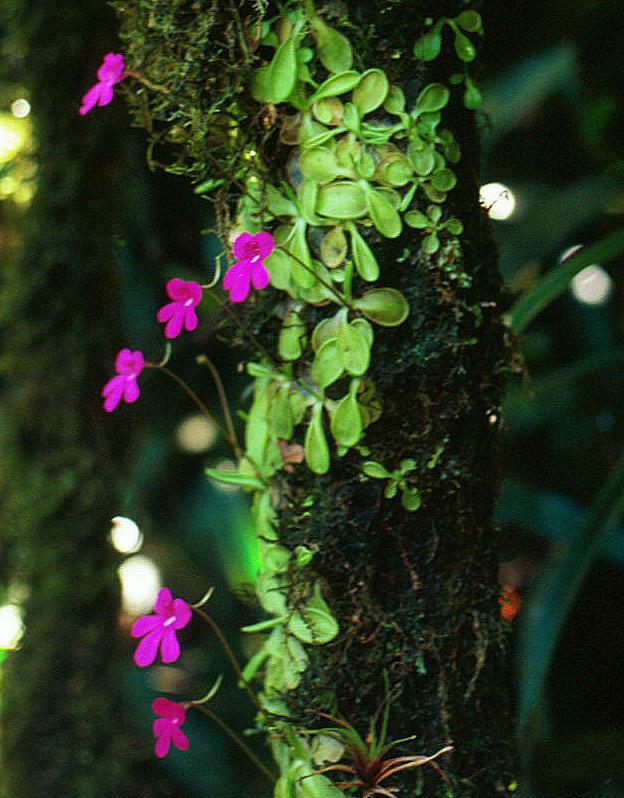 This species was mistaken in the past for Pinguicula moranensis HBK until Dr Sergio Zamudio, the well known Mexican botanist, studied it and gave a true species rank for this wonderful species. These plants are different in the Size of the flower and the forms of the tube and the corolla lobes. 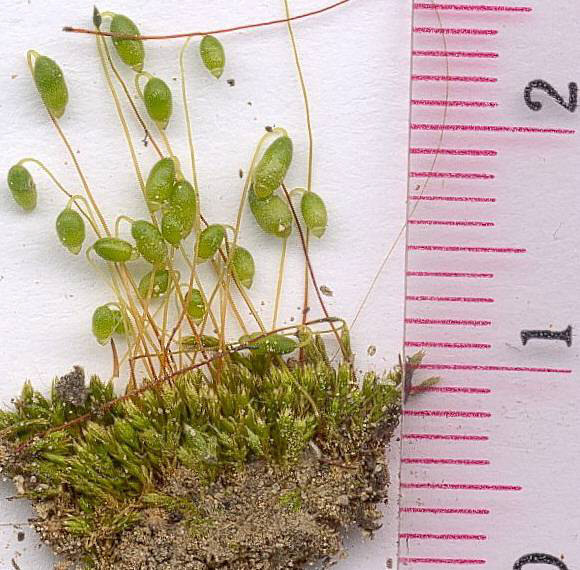 These plants are generally epifites, smaller and delicate that those of Pinguicula moranensis and inhabits in wet area within the mesophyllous mountain forest. 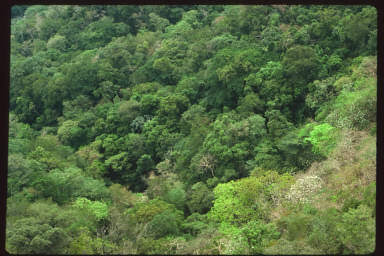 A mesophyllous mountain forest is caracterized by humid areas with several strata and abundant climbers and epiphytes. - National Park of Montecristo, Municipality of Metapapan, in the Miramundito. 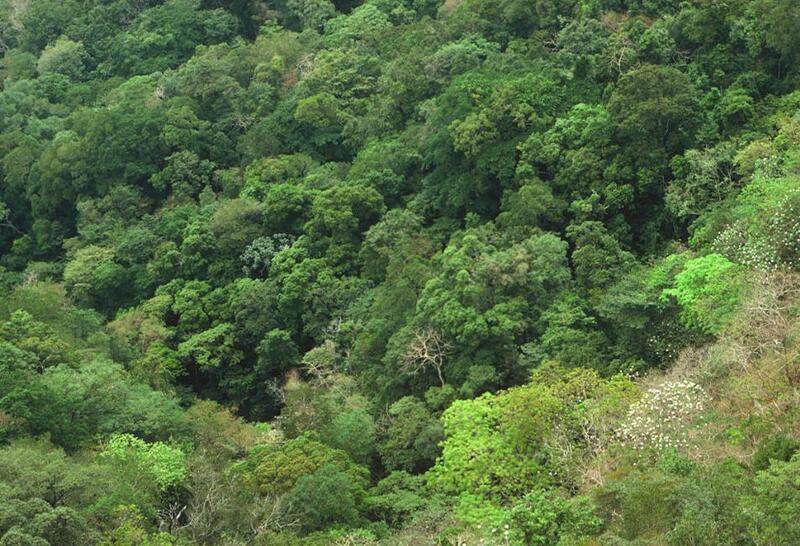 - On cerro Brujo, Southeast of Concepcion de las minas. - Department of Ocotepeque, road of Belén Gualcho, 15 km NE of the village. 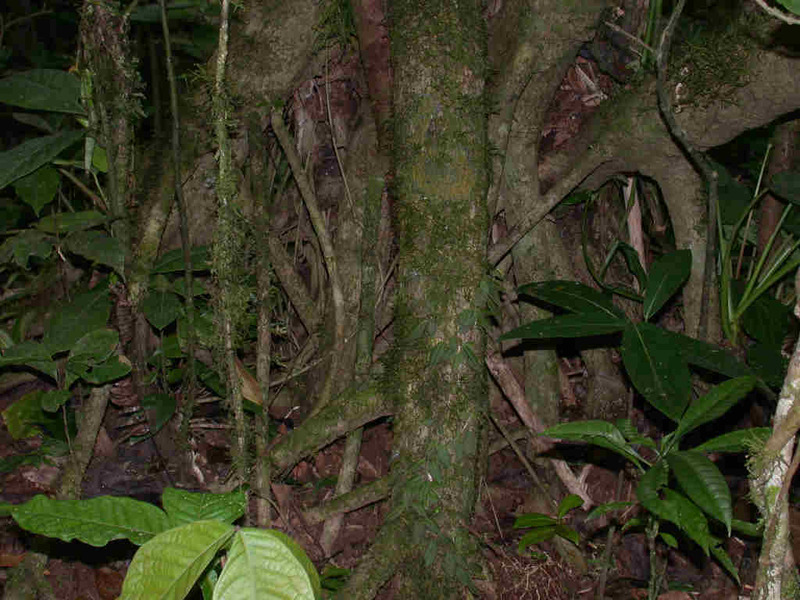 According to the publication and the photos I saw in Oliver Komar's homepage (http://www.nhm.ku.edu/komar/), The plants can be found in mesophyllous mountains forests, with Hedyosmum, Liquidambar, Persea and Pinus. 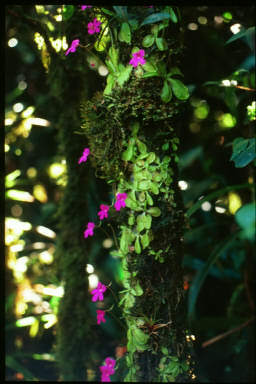 The plants grow as epiphytic on mosses on tree trunks exposed to wind, or as rupicole near the wet areas of cascades. The plants grow at altitudes between 1300 to 2400m. Not yet. I only get seeds on December 2002 from an anonymous donator, with the only mention : "from culture, not wild collected". The seeds are labelled "Verapaz, Guatemala". No more information. If the donator could contact me, this will be very useful. 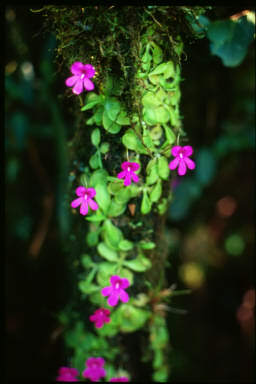 Pinguicula mesophytica, in Parque Nacional Montecristo, El Salvador. Typical "Bosque mesofilo de montana". It is located in ravines and in an area protected from wind and sun, which favours a high air humidity. 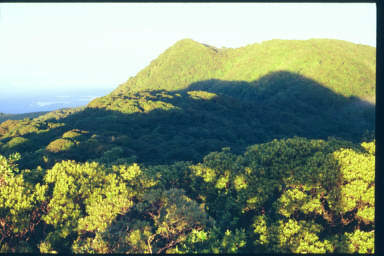 Montecristo National Park in el Salvador. This is a medium-sized tree with a much-branched trunk. Low branches can grow roots which penetrate the soil separately from the main trunk; new branches and roots can divide multiple times, producing a jumbled network at the base of the tree. 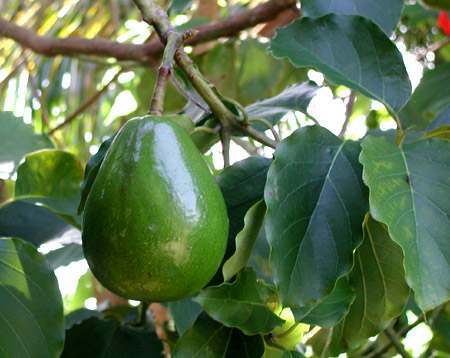 The well-known fruit of the Persea.